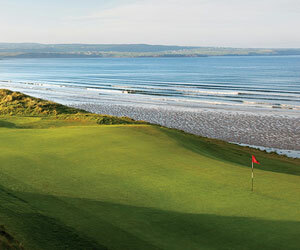 WESTWARD HO!, ENGLAND - It's the second hole at Royal North Devon Golf Club in England's Southwest. I've got an approach shot in the air off the face of my 8-iron, and I'm nervous. Not because it might find gorse or sand. Actually, it was a pretty good shot. I'm nervous because my ball's line is headed straight towards a sheep who wandered in front of the green. After what feels like an eternity, the ball sails just over the sheep. Startled, it darts its head toward me with a "baaaaah!!!" which I believe can be closest translated as, "Hey, buddy! I'm grazin' here!" Welcome to Royal North Devon Golf Club, also known as "Westward Ho! ", England's oldest links, and where to the visitor, nothing seems to have changed since its founding in 1864. These links have a rich history, most evident in the clubhouse, full of old trophies and photos of past visitors like Harry Vardon, James Braid and Herbert Fowler, all of whom have whacked it around R.N.D (though the pride of the club remains J.H. Taylor, who grew up in the village of Northam overlooking the golf course). He caddied and learned the game at R.N.D. before going on to win the Open Championship five times from 1894 thru 1914. Members here, casual but as passionate about the game as you'll find, are all too happy to show you around these walls. One wonders how many generations of sheep have grazed over North Devon, but these sheep are hardly shy about getting in your way. You'll also share the grounds with a herd of horses. They, too, seem oblivious to golf course etiquette. "You hear the ground rumbling, and you know you need to look out," one member warned of their occasional stampedes. Today, R.N.D. has been stretched to over 7,000 yards to accommodate top amateur tournaments in the British Isles, but daily players will encounter their own stiff test at 6,500 yards from the white tees. Once you make it past the sheep after the second hole, some of the course's most scenic holes are up next. No. 4, a short par 4, features a carry straight over what was once the British Isles' widest bunker, named the "Cape" bunker. Holes six through eight all play along the sea and get closer and closer to the beach every year. According to club officials, they lost 25 yards of golf course to erosion alone last year. The 10th hole is the beginning of the "rush holes." Great sea rush, a vicious plant, takes over the golf course and serves as a way of blocking visibility from the tee, and on holes like the par-4 11th, surround the fairway and must be carried off the tee. Don't spend much time looking for your ball in them either, they can be poisonous. The 18th is a stern finishing hole. Its Stroke Index will fool you as the easiest hole on the golf course. That's just for match play purposes however. It's a long, 414-yard par 4, uphill to the green with a burn running in front of the green, which prevents much chance of running it up. Into a stiff wind, hitting this green in two is practically impossible. England's oldest links, Royal North Devon Golf Club isn't the type of course on which you'd want to bet big cash amongst your foursome. It's a pretty quirky 18 holes. But it's impossible to dispute its uniqueness, and for North American travelers, it's definitely worth seeing. Little has changed since its foundation, it seems. Its membership is also of a friendly, welcoming nature. So, visitors will feel right at home here. The club also takes pride in having the largest junior section in England, and on the day of my visit, there were scores of young golfers on the links. Royal North Devon is one of the six links featured on England's Atlantic Links tour. Nearby Padstow is a little fishing town full of old streets and little shops. It's also home to four restaurants from celebrity chef Rick Stein, which has helped to give Padstow the nickname "The seafood capital of Great Britain." Right in the heart of the village overlooking the Camel Estuary is four-star The Metropole Hotel (www.the-metropole.co.uk). It was built at the beginning of the 20th century and is full of turn-of-the-century Victorian charm. All but two rooms overlook the harbor, as well as the dining room and patio areas. The hotel has its own restaurant serving up fresh seafood caught locally as well. The Metropole is a good point between St. Enodoc, another must-play links in England's Southwest and Royal North Devon. For more information, call (0)1237 477598 or visit atlantic-links.co.uk.